In 1967, while on vacation in California, Howard Rees was driving past Mattel and decided to stop and visit a friend who was working there. Coincidentally, Ira Gilford, the Hot Wheels® designer at that time, had quit earlier that day and Rees was offered the job. Rees relocated from Detroit to sunny California to become the only Hot Wheels designer. He designed Hot Wheels cars for the next two years, first finishing some of the models that were started by Ira Gilford. Howard is an 2013 Inductee at the Diecast Hall of Fame, where he won the Diecast Hall of Fame Class of 2013's Diecast Designer Award. 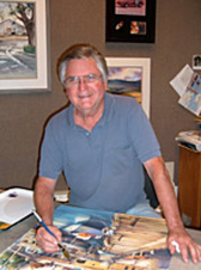 Howard Rees went to the Art Center College of Design, in Los Angeles, where he earned his Bachelor in Fine Arts Degree in 1964. Later he accepted a position with Ford Motor Company in England. After leaving England he continued to work with Ford in Detroit, designing the ever popular Mustang line. Cold, long, Michigan winters drove him back to California and to The Mattel Toy Company where he designed many of the red line era Hot Wheels cars. Later he worked on the Major Matt Mason action figure toy line-up. When he stopped designing Hot Wheels, his good friend Larry Wood, who he had worked with at Ford, took over his job.